Dolly Parton is celebrated as a performer, a singer, a personality, a mogul, an actress, and icon. But these aren’t even her greatest accomplishments. Her most impressive achievement is her spectacular catalog as a songwriter. Few artists in popular music over the past 50 years can boast as strong and lasting a collection of work as The Leading Lady of Country. As Dolly continues a tour that has been ongoing for most of this year, let’s take a moment to appreciate her career as a songwriter first and foremost, with a special focus on her gifts as a storyteller in song. Although only the drawn from the songs that she has written herself, not everything she’s recorded in her vast discography, here are the 12 best songs written and performed by Ms. Dolly Parton. 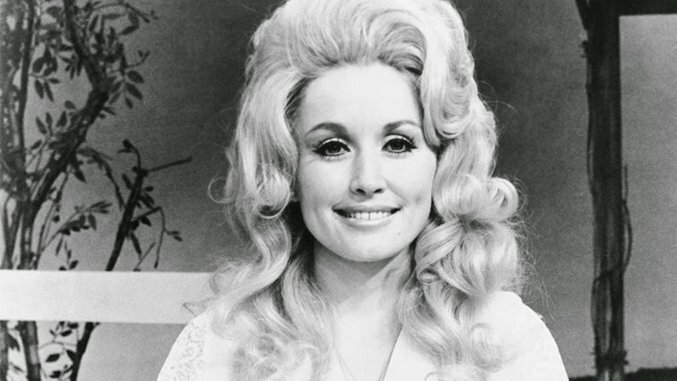 Dolly’s incredibly productive years of collaboration with Porter Wagoner from 1967-1976 yielded dozens of classic tunes, many of which bear her unmistakable songwriting touch. This one in particular is Dolly through-and-through. The story is told in the voices of a mother and father, reflecting on their daughter’s fear of the dark after a visit to a cemetery. Dolly delivers a lump-in-the-throat twist ending, with Wagoner lending a broken-man spoken verse to seal the deal. Dolly masters the art of transforming a simple, familiar phrase into resonant domestic drama. Does this unabashed tearjerker cross the line from being sad into being pitiful? Well, yes. But there’s a necessary suspension-of-eye-rolling you’ve committed to when you love country music, so let a tear fall and just appreciate the skill it takes to pull off a genuinely touching song. As Dolly gradually hints at the dark backstory of a spunky girl and her dog, a tune of unrelenting sweetness gains surprising emotional texture, earning a tender heartache that we just keep wanting to feel. Dolly doles out some great relationship advice in this song and makes it stick with a beautiful and unforgettable chorus. The verses walk her interlocutor through a series of scenarios where a little human contact can make all the difference to her— after an argument, when she’s feeling sad and, if those work out, maybe when the lights go out tonight. This is one of those tunes that is so classic you almost forget what a fundamentally solid song it actually is. Dolly scored one of her biggest hits with this theme song to the equally classic movie, summing up the working life with bright lines like “Tumble outta bed, stumble into the kitchen, pour myself a cup of ambition.” But below the clever turns of phrase and sax-happy hooks, the song’s themes of being underpaid and underappreciated in the workplace as a result of one’s gender are as relevant and troubling today as when the song debuted over 35 years ago. Dolly makes it all sound like a party, but she means business too. Dolly’s narrative powers are strong here, as she paints a complex portrait of a troubled mother from the perspective of her daughter who only sees her obediently doing what her husband expects of her. And she must not mind doing it, “or if she did,” Dolly sings, “she never did say so to daddy.” What the mother doesn’t say—and what the daughter doesn’t know about her—illustrates a lonely, haunted world in the story. In the span of just a couple minutes, listeners find the daughter come of age, as her perception of her family confronts its harsh reality. Dolly keeps the mood light with her vocal performance, but still winds up delivering one of the sharpest and harshest family stories in her vast catalog. This is the best of Dolly’s funny songs (and there are a lot) because of the perfect pairing of a an up-tempo pace with a tightly packed story of a mischievous girl who tries to keep her affair with a traveling salesman a secret from her mother…only to find that her mom is planning to run off with him, too. Dolly also manage to rhyme “courtin’” with “oughtn’t” in this song, which alone would’ve likely granted access to the Opry if she’d never written another song in her life. This song, on the other hand, is the most devastating of Dolly’s many sad songs. Reflecting on themes that were very far outside popular music of its era, “Down From Dover” uses carefully chosen details and imagery to illuminate a story of a woman who starts showing too much to hide her pregnancy any longer. She tries to maintain hope as she waits for the baby’s father to come “down from Dover” to help but in the meantime consequences are piling up. Dolly’s sympathetic but unsparing view follows the narrative to a tragic conclusion with fearless poetic control. Written to Porter Wagoner when their duet years came to a close, and adopted universally as the ultimate break-up song (made famous, of course by Whitney Houston for The Bodyguard), this masterpiece that will outlive Dolly by centuries. She taps into a deep melodic vein with one of the most stirring choruses in country music, made all the more powerful by the dynamic build from one refrain to the next and culminating in one of the great vocal riffs on the final refrain. We bow at the alter of Dolly not only for her sophistication as a lyricist and her knack for making a hit, but also for her capacity to transcend her genre and era to write an American standard. One of country music’s all-time best and most popular songs, “Jolene” still hits the mark to this day. In fact, we’ve already listed 10 epic covers of the song https://www.pastemagazine.com/articles/2016/02/10-awesome-renditions-of-dolly-partons-jolene.html. But unlike many of Dolly’s best narratives, this song takes place in one scene, one setting, woman to woman. The image of a wife begging her rival not to steal her husband—“even though she can”—transmits a terrible vulnerability. Dolly’s knockout vocal characterization brings the story to life, especially on a chilling harmonized lick after the final entreaty, while she waits for Jolene to decide her fate. This is the master’s signature song, as intriguing to the imagination and the ear today as ever.